This is a very exciting time to be a neuroscientist at the University of Rochester. In parallel with new initiatives to bring in new researchers, expand our basic and translational research enterprise, and create new areas of excellence, we have been working hard to expand and improve our graduate training program. 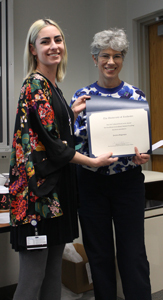 This year we submitted a proposal to the Jointly Sponsored Ruth L. Kirschstein National Research Service Award Institutional Predoctoral Training Program in the Neurosciences (T32). We hope that securing this funding will allow us to recruit additional students to the program and provide novel training opportunities that focus on rigor and reproducibility as well as training in quantitative approaches, both priorities identified by the NIH and the Society for Neuroscience. This year we welcome eight first year graduate students. Please learn more about them on pages 3 and 4. All of them are highly accomplished and bring different research and educational experiences to our program. Four of this class have already won honors at convocation: Katherine Andersh (Irving L. Spar Award), Berke Karaahmet (Merritt and Marjorie Cleveland Fellowship Award), Allison Murphy (J. Newell Stannard Graduate Student Scholarship Award), Karl Foley (Walle J.H. Nauta Award for Excellence in the Neurosciences). Congratulations! For more achievements by our students please read on. We also welcomed new faculty to our program including Farran Briggs, David MacLean, Edmund Lalor, Ross Maddox, Martina Poletti and Hugh Xia, and they are already busy training our students in different forums. This year we had a record number of defenses. We said goodbye to Matthew Cavanaugh, Berkeley Fahrenthold, Kelli Fagan, Julianne Feola, Nguyen Mai, Stephanie Syc-Mazurek, Xiaowei Wang, Laura Yunes-Medina, Shiona Biswas, Evan McConnell, John O’Donnell, Heather Natola, and Rebecca Rausch. We wish them well and look forward to hearing about their successes in the future. We have some updates for you, so check out the interesting things they are doing with their neuroscience PhDs. I want to thank all of our students and faculty for the many things they do to make our graduate program a success. I enjoy interacting with all of you. As always, I’d love to receive feedback and suggestions for the program from faculty, students and community members at any time. Feel free to e-mail, call or come by my office. The main office of The Del Monte Institute for Neuroscience has moved to the Ground Floor of the Kornberg Medical Research Building (G.9602). Come see the sleek design! It has been another whirlwind year for the Del Monte Institute for Neuroscience and the Department of Neuroscience. We have recruited a cohort of very exciting new faculty members in partnership with multiple departments on both the River Campus and here at the Medical School. 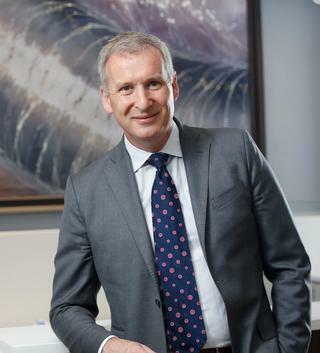 The past 20 months have seen the arrival of Krishnan Padmanabhan, Ross Maddox, Ed Lalor, Farran Briggs, Hugh Xia, Martina Poletti and David McLean. They are all superb young neuroscientists with cutting-edge research programs that span the gamut —from molecular and cellular systems, to integrative in vivo work in model systems, to systems work in both healthy and clinical human populations. The depth and breadth of work going on in our Institute for Neuroscience is truly astonishing, and it continues to grow at a fantastic rate. Another batch of new faculty members will arrive in the months ahead, including Michele Rucci and David-Dodell Feder. I encourage you to go to PubMed and look up all the amazing work these folks will bring to the U-of-R. It won’t end there. We fully expect to recruit another 4-6 faculty as part of the execution of the university-wide Neuroscience strategic plan, with areas of particular emphasis being Alzheimer’s disease, Augmented and Virtual Reality, Intellectual and Developmental Disabilities, and neural device design. Major renovations of lab space are underway in the Kornberg Medical Research Building and in The Rochester Center for Brain Sciences, and just a couple of months ago, we opened the new Neuroscience administrative offices right off the Flaum Atrium (very handy for grabbing a cup of coffee). The NGP office is housed within this suite, so I am looking forward to running into you all regularly. We are absolutely delighted to have you here with us and look forward to your vigorous participation in our exciting new programs in the year ahead. Another successful admissions season has brought eight strong first-year students to the Neuroscience Graduate Program. The 2017 admissions committee reviewed over 100 applications from around the world and hosted nearly 30 candidates over three separate interview days. None of this could have happened without the tireless efforts of the committee (Suzanne Haber, Ania Majewska, John Olschowka, Liz Romanski, Ruchira Singh, and Ania Dworzanksi) and of the many NGP faculty who took time to interview applicants and attend recruitment events. As always, our current students also played a key role in the success of our recruitment season. Jessie Hogestyn, Gavin Jenkins, and Neal Shah coordinated a terrific set of scientific and social activities, including a data blitz, a housing tour, and a student party. Thanks also to the many current NGP students who escorted applicants around campus and attended lunches and dinners. These efforts make a real difference: our applicants consistently note not only the great science being done here, but also the warm, welcoming environment and the strong sense of community in the Neuroscience Graduate Program. In the end, we recruited eight terrific new first-year students to NGP — you can learn more about them elsewhere in this newsletter. The 2018 recruitment season is not far off! The admissions committee welcomes your input, so please send any feedback and/or ideas for improvement to Tori D’Agostino or Doug Portman. Please also let us know if you’re interested in joining the faculty or student admissions committee. Thanks again for your efforts in helping to recruit the best students to our program! Samantha Abbott graduated from UW-Whitewater with a B.S. in Psychology and a minor in biology. She conducted her undergraduate research under Dr. Meg Waraczynski studying the role of the extended amygdala on reward evaluation in rats. She completed a senior thesis project examining the role of a voltage-gated calcium channel (Cav1.3) in this circuitry. After finishing her degree, Samantha worked in an adult family home setting helping adults with severe mental illness and developmental disabilities learn how to live independently. She is currently interested in researching the biological basic for psychiatric disorders. Katherine Andersh recently graduated from the University of Arizona with a Bachelor of Science in Neuroscience and Cognitive Science with a Neurobiology emphasis. During her time at the University of Arizona, she worked primarily in the lab of Dr. Carol Barnes studying age related learning impairments in macaques utilizing both behavioral analysis and immunohistochemistry. In her graduate studies, she hopes to further explore neurodegenerative diseases and injury as well as neural repair. 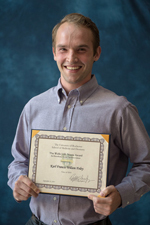 Karl Foley received his B.A. in Cognitive Science with a Correlate in Mathematics from Vassar College in 2014. 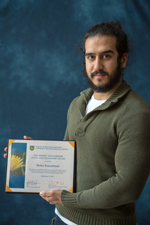 His undergraduate research included EEG studies of category learning, behavioral genetics studies of amphetamine response in Drosophila, psychological studies of shared experience, and his thesis on the role of neuropeptide Y in reward response and circadian rhythms in Drosophila. Before entering the MSTP at Rochester, he worked at Columbia University as a data analyst in the departments of nephrology and neurology. 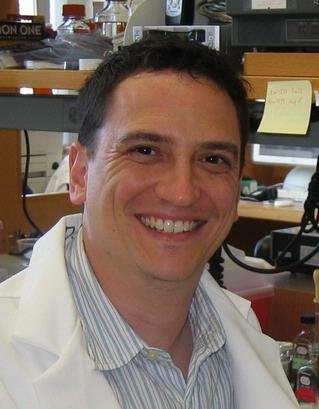 At Rochester, he is now focused on PP1 regulation in synaptic plasticity in Hugh Xia's lab. Berke Karaahmet graduated from Bilkent University, Turkey with a BS in Molecular Biology and Genetics and a minor in Psychology. His most pertinent research experiences come from his work in Prof. Blomgren’s lab at Karolinska Institutet, Sweden in which he characterized the rescuing effects of lithium treatment on neurogenesis following irradiation and his work in Prof. Güre’s lab at Bilkent in which he performed in silico analyses to discover biomarkers of bipolar disorder. At URMC, he hopes to study glial cell biology and explore its implications in translational research. Allison Murphy graduated from Denison University in 2017 with a B.S. in biology with a neuroscience concentration. She has worked in labs at Denison as well as at West Virginia University and New York University, researching optic vesicle development, psychophysics of radial and rotational motion, and neuron distributions in macaque V2. Most recently, her senior research focused on structure-function relationships between sensory neurons and nociception in Drosophila larvae. She is excited to continue exploring her interests at Rochester! Keshov Sharma graduated in 2015 with a Bachelor’s Degree in Neuroscience and minors in Chemistry and Religion from Duke University. During his undergraduate, he worked for James McNamara, M.D. studying the molecular mechanisms of epileptogenesis and working on lead development for a novel anti-epileptic pharmaceutical. His undergraduate thesis work characterized the effects of inhibiting BDNF/Trk-B signaling on epileptogenesis in a murine model. After graduating, he joined University of Rochester’s MSTP and has since been studying medicine. He hopes to conduct research into the functional circuitry of fear learning in the non-human primate at URMC. Anjali Sinha graduated with Bachelor's Degree in Biotechnology from the PES Institute of Technology, Bangalore (India). She completed her Master's Degree in Neuroscience at the University at Buffalo where she worked with Dr. Fraser Sim. 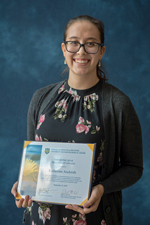 Her Master's thesis looked at transcription factors that regulate cell cycle dynamics and quiescence in human oligodendrocyte precursors and various mechanisms that regulate these transcription factors during development and post-injury. At URMC, Anjali is interested in working on neuron-glia interactions and their role in various neurodegenerative disorders. Brendan Whitelaw, from Swarthmore PA, graduated from University of Pennsylvania in 2015 with a BA in Biochemistry and Biology and an MS in Chemistry. As an undergraduate, he conducted research on the relationship between astroglial glutamate transport and glutamate metabolism in the lab or Dr. Michael Robinson. He is an MD/PhD student, and has been in medical school for the past two years. He is interested in neuroimmunology, specifically how microglia affect normal brain development and synaptic plasticity. Neuroscience Graduate Program student Jessica Hogestyn, a student in the Mayer-Pröschel Lab, has been selected as one of the winners of the 2017 Edward Peck Curtis Award for Excellence in Teaching by a Graduate Student. Her nomination material exemplified her ability as an outstanding educator with bright future. Jessica also placed third at the Graduate Student Society Poster Session. Ally for received the 2017 Trainee Professional Development Award from the Society for Neuroscience. The award will support travel to this year’s meeting in Washington, DC, and a special poster session for all trainees at the meeting. 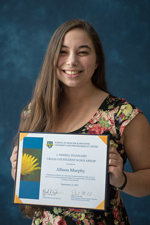 Ally will also benefit from admission to Professional Development Workshops, and presentation of her poster in the meeting at-large, Wednesday November 15. Matt Cavanaugh is a post-doc with Dr. Steve Feldon. Matt is running a clinical trial, under Dr. Feldon, on the training program they developed in lab to bring it through the FDA approval process. John O’Donnell is a post-doc with Dr. Joel Perlmutter at Washington University in Saint Louis this fall, studying neuromodulators in cognitive decline in Parkinson's Disease. Laura Yunes-Medina is a Postdoctoral Research Fellow at the Indiana University School of Medicine. Syc-Mazurek SB, Fernandes KA, Wilson MP, Shrager P, Libby RT (2017 Oct 02). Together JUN and DDIT3 (CHOP) control retinal ganglion cell death after axonal injury. Molecular neurodegeneration. Yunes-Medina L, Feola J, Johnson GVW (2017 Sep 27). Subcellular localization patterns of transglutaminase 2 in astrocytes and neurons are differentially altered by hypoxia. Neuroreport. Apara A, Galvao J, Wang Y, Blackmore M, Trillo AIwao K, Brown DP, Fernandes KA, Huang A, Nguyen T, Ashouri M, Zhang X, Shaw PX, Kunzevitzky NJ, Moore DL, Libby RT, Goldberg JL (2017 Sep 04). KLF9 and JNK3 Interact to Suppress Axon Regeneration in the Adult CNS. The Journal of neuroscience : the official journal of the Society for Neuroscience. Mestre H, Kostrikov S, Mehta RI, Nedergaard M (2017 Sep 01). Perivascular spaces, glymphatic dysfunction, and small vessel disease. Clinical science (London, England : 1979). Lowery RL, Tremblay ME, Hopkins BE, Majewska AK (2017 Aug 24). The microglial fractalkine receptor is not required for activity-dependent plasticity in the mouse visual system. Glia. Mai N, Prifti L, Rininger A, Bazarian H, Halterman MW (2017 Jul 27). Endotoxemia induces lung-brain coupling and multi-organ injury following cerebral ischemia-reperfusion. Experimental neurology. Syc-Mazurek SB, Fernandes KA, Libby RT (2017 Jul 20). JUN is important for ocular hypertension-induced retinal ganglion cell degeneration. Cell death & disease. Steevens AR, Sookiasian DL, Glatzer JC, Kiernan AE (2017 Jun 22). SOX2 is required for inner ear neurogenesis. Scientific reports. Campbell A, Hogestyn JM, Folts CJ, Lopez B, Pröschel C, Mock D, Mayer-Pröschel M (2017 Jun 21). Expression of the Human Herpesvirus 6A Latency-Associated Transcript U94A Disrupts Human Oligodendrocyte Progenitor Migration. Scientific reports. Scott-Hewitt NJ, Folts CJ, Hogestyn JM, Piester G, Mayer-Pröschel M, Noble MD (2017 May 31). Heterozygote galactocerebrosidase (GALC) mutants have reduced remyelination and impaired myelin debris clearance following demyelinating injury. Human molecular genetics. Feola J, Barton A, Akbar A, Keillor J, Johnson GVW (2017 May 15). Transglutaminase 2 Modulation of NF-κB Signaling in Astrocytes is Independent of its Ability to Mediate Astrocytic Viability in Ischemic Injury. Brain research. Balasubramanian R, Bui A, Dong X, Gan L (2017 Apr 29). Lhx9 Is Required for the Development of Retinal Nitric Oxide-Synthesizing Amacrine Cell Subtype. Molecular neurobiology. Gilels F, Paquette ST, Beaulac HJ, Bullen A, White PM (2017 Apr 21). Severe hearing loss and outer hair cell death in homozygous Foxo3 knockout mice after moderate noise exposure. Scientific reports. Cavanaugh MR, Huxlin KR (2017 Apr 12). Visual discrimination training improves Humphrey perimetry in chronic cortically induced blindness. Neurology. Sun W, Cornwell A, Li J, Peng S, Osorio MJ, Su Wanga NA, Benraiss A, Lou N, Goldman SA, Nedergaard M (2017 Mar 23). SOX9 is an astrocyte-specific nuclear marker in the adult brain outside the neurogenic regions. The Journal of neuroscience : the official journal of the Society for Neuroscience. Sleezer BJ, Loconte G, Castagno MD, Hayden BY (2017 Feb 08). Neuronal responses support a role for orbitofrontal cortex in cognitive set reconfiguration. The European journal of neuroscience. Wong EL, Stowell RD, Majewska AK (2017 Jun 9). What the Spectrum of Microglial Functions Can Teach us About Fetal Alcohol Spectrum Disorder. Frontiers in synaptic neuroscience. Cho YT, Fudge JL, Ross DA (2016 Dec 15). The Architecture of Cortex-in Illness and in Health. Biological psychiatry. Sweet TB, Hurley SD, Wu MD, Olschowka JA, Williams JP, O'Banion MK (2016 Dec 1). Neurogenic Effects of Low-Dose Whole-Body HZE (Fe) Ion and Gamma Irradiation. Radiation research. Sleezer BJ, Castagno MD, Hayden BY (2016 Nov 2). Rule Encoding in Orbitofrontal Cortex and Striatum Guides Selection. The Journal of Neuroscience : the official journal of the Society for Neuroscience. Wang F, Wang X, Shapiro LA, Cotrina ML, Liu W, Wang EW, Gu S, Wang W, He X, Nedergaard M, Huang JH (2016 Sep 1). NKCC1 up-regulation contributes to early post-traumatic seizures and increased post-traumatic seizure susceptibility. Brain structure & function. Wei HS, Kang H, Rasheed ID, Zhou S, Lou N, Gershteyn A, McConnell ED, Wang Y, Richardson KE, Palmer AF, Xu C, Wan J, Nedergaard M (2016 Aug 3). Erythrocytes Are Oxygen-Sensing Regulators of the Cerebral Microcirculation. Neuron. Lundgaard I, Lu ML, Yang E, Peng W, Mestre H, Hitomi E, Deane R, Nedergaard M (2016 Aug 1). Glymphatic clearance controls state-dependent changes in brain lactate concentration. Journal of cerebral blood flow and metabolism: official journal of the International Society of Cerebral Blood Flow and Metabolism. In the Briggs laboratory, we are interested in understanding how specific and identified cortical circuits encode information about the visual world. We also examine how attention impacts the way in which visual information is encoded by neurons and circuits. We use a variety of technical approaches including multi-electrode array recordings in alert and behaving animals trained on attention-demanding tasks and combination of multi-electrode array recordings with optogenetics to record and manipulate the activity of select neuronal populations in intact animals. In order to match neurophysiological recordings to identified neurons and circuits, we perform histology and reconstruct the anatomical structure of recorded and labeled neurons. The Cognitive Neurophysiology Lab (CNL) is a research outfit which utilizes human neurophysiological measurements to answer questions relating to the etiology, pathology, and functional consequences of various neurological disease states. The lab has a strong history of conducting basic science research focused on how, when, and where the brain combines information from the separate sensory systems to produce holistic percepts and task relevant behaviors. The CNL utilizes a variety of techniques including the EEG, structural and fMRI scans, DTI, and electrocorticography often paired with a variety of other physiological measures such as eye movements and locomotive behavior. Making use of a wide network of collaborations with other researchers and clinicians throughout the greater UR system the CNL currently has active studies relating to Autism, Dyslexia, HIV/AIDS, Addiction, Batten & Rett disease, Cystinosis as well as typical neurological development. Students rotating in the CNL will develop significant experience in the design of human experiments, the collection neurophysiological data and the use of various analysis methods. Hearing difficulties are widely thought to originate from hair cell damage within the inner ear. Recent studies reveal that auditory-nerve degeneration accumulates with age and with overexposure to loud sound, often in isolation from hair cell damage. However, the perceptual consequences of auditory-nerve damage are unclear. Current experiments in the Henry lab seek to understand the effects of auditory-nerve damage on central processing and perception of complex sounds. Studies are conducted in avian model species with human-like auditory perceptual capabilities and the capacity to mimic speech. Students in the lab can gain experience in techniques for operant conditioning of behaviorally trained animals, producing neural lesions, and recording neurophysiological activity. One of the main projects in my lab is to determine the role of small ubiquitin-related modifier (SUMO) in neurodegeneration. Enhanced sumoylation and accumulation of SUMO-conjugated proteins have been widely observed in patients with various neurodegenerative disorders, including Alzheimer’s disease, Huntington’s disease and Parkinson's disease. Targeting the SUMO pathway is likely to offer new strategies for disease prevention and therapy. This idea is supported by our recent study demonstrating a direct involvement of SUMO modification enzymes in neurodegeneration. We have developed several additional genetic modified mouse models to further elucidate the pathogenic mechanism underlying SUMO-mediated neurodegeneration. I am looking for 1-2 students this year. Speech is central to human life. However, how the human auditory system actually converts the spectrotemporally complex acoustic patterns of natural speech into meaning is poorly understood. This is particularly true in naturalistic settings where speech signals often compete with other environmental sounds, and where listeners use attention and visual input to help with comprehension. Research in the Lalor lab uses electroencephalography (EEG) to study these questions from several different angles. The overarching goals are: 1) to gain a better understanding of the fundamental neural mechanisms underlying speech and language processing, “cocktail party” attention, and the integration of audio and visual speech, and 2) to apply this understanding to research in particular populations and to the development of technology for improving the ability of people to listen successfully in challenging environments. Students rotating in the lab will have an opportunity to engage in the design of stimuli and experiments, the recording of EEG, and the analysis of both behavior and electrophysiological data using MATLAB. They will work closely with other lab members and participate in the lab's weekly Journal Club. My research focuses on understanding the underlying neurophysiological mechanisms of cognitive impairment and designing and implementing behavioral interventions targeting those mechanisms in order to promote neuroplasticity and ultimately prevent dementia. Students interested in my lab need prior research experience in geriatrics/gerontology or cognitive science. Students will have opportunities to work on multiple NIH funded projects related to neuroimaging, neuroplasticity-based interventions, neuropsychology, and Alzheimer’s disease. Research in the Maddox Auditory & Multisensory processing lab is focused on listening--how do most people perform so well in noisy situations, and what causes some people to struggle. We use human behavior, electroencephalography, and eye-tracking to explore a range of questions. Our basic neuroscience questions include how visual stimuli help us listen in noisy places, and how feedback connections in the auditory pathway modify brainstem processing. Our clinical aims include developing accurate and efficient tools for measuring hearing in newborns. We are also working on developing a "visual hearing aid" that renders an artificial talking face from speech audio, with potentially broad applications for listeners with hearing impairments, second language learners, and disorders of attention. Rotation projects could be in any of these areas. We have room for 1-2 students. The ability to briefly store visual information is fundamental to successful execution of visually guided behaviors. Research in my lab is aimed at the study of the circuitry underlying the active maintenance of the representation of sensory information, i.e. sensory working memory. The overriding goal is to provide a link between cortical areas traditionally associated with processing of visual motion (area MT) and the region identified with cognitive control of visually guided behaviors, prefrontal cortex and relate neural activity recorded in these two regions to perceptual decisions. Students rotating in the lab will have an opportunity to become familiar with procedures involved in neurophysiological recordings from behaving monkeys, including behavioral training techniques, single-cell recordings, analysis of neuronal activity, approaches to the study of behavioral effects of microstimulation and inactivation of identified cortical regions. They will work closely with other lab members and participate in the lab's weekly Journal Club. Previous research has shown that the primate ventral prefrontal cortex, a proposed homologue of human inferior frontal gyrus, has neurons that are specialized for processing and integrating face and vocal information and may be involved in social communication. In our laboratory we record from single neurons in the ventral prefrontal cortex of nonhuman primates while they perform tasks where they integrate and remember faces and vocal information. Our experiments are aimed at understanding: 1. How single neurons and ensembles of cells participate in audiovisual integration and memory (studied with neurophysiological recording and analysis of population data). 2. What are the connections of ventral prefrontal cells (studies with anatomical tract tracing). 3. How temporal lobe-prefrontal cortex networks function in social communication, social behavior and sensory integration (involves neurophysiological recording from temporal lobe regions simultaneously with prefrontal cortex, cortical inactivation, lesion and behavioral experiments). Rotating students will become familiar with behavioral training of nonhuman primates, neurophysiological recording methods as well as general microscopy in order to chart histological data from previous anatomical tract tracing experiments using NeuroLucida. Our lab investigates blood flow in the living eye by using a specialized camera called an Adaptive Optics Scanning Light Ophthalmoscope (AOSLO) to correct for small imperfections of the optics of the eye. Once corrected, we can image the microscopic integrity of the smallest vessels that are ten-times thinner than a human hair. Additionally, capturing videos of this tissue enables study of the movement of single blood cells flowing within this network. We are developing and applying this cutting-edge technology to study blood flow in the retina in conditions of health and disease. We have room for multiple students. Paths of Least Resistance is inspired by the chaotic and fractal-like erosion patterns of mountains and river systems seen from satellite images. Just as chaotic variables carve beautiful neural shapes into the land, developing neurons interact to self-organize into similarly beautifully fractal-like patterns—interacting dendrites and axons find their own paths of least resistance. The large white neuron on the left of the painting is drawn directly from the map of Rochester's highway system, illustrating a direct parallel between information distribution networks, road systems and neurons, each governed by similar chaotic and topographical forces giving rise to their fractal-like structure. The technique used, microetching, was developed by Dr. Greg Dunn and Dr. Brian Edwards. Microetchings are handmade lithographs that manipulate light on a microscopic scale to control the reflectivity of metallic surfaces, changing the way a viewer experiences a painting. These works are created to remind us that the most marvelous machine in the known universe, the brain, is at the core of our being and the root of our shared humanity. The University of Rochester Brain Awareness Campaign (BAC) was established in 2013 by Neuroscience Graduate Program Director Dr. Ania Majewska and a group of graduate students. Supported by the Rochester chapter of the Society for Neuroscience and the U of R Neuroscience Department, the campaign was developed with the goal of sharing our excitement for neuroscience with elementary school children in the greater Rochester area. Each spring for Brain Awareness Week, BAC members develop hands-on activities for children in grades K-6 that demonstrate the critical functions of the brain at both the cellular and systems level. These activities have covered topics from signal transduction to sensory systems to autonomic functions, all with the goal of conveying the important roles the brain plays as we interact with the world around us. Activities developed for Brain Awareness Week 2017 illustrated the cooperation of single neurons and the greater lobes of the brain in different motor tasks, while a demonstration of the Stroop Effect showed students how conflicting stimuli can trick our brains into making mistakes. We also took these activities to the Rochester Area Girl Scouts where we worked with smart young ladies in grades 6-9 as they worked through the scientific method to create and test hypotheses about the prism goggles and the EMG kits, as well as create posters explaining their results. At the end of the day, the girls took home a Neuroscientist for a Day badge, designed by Nicole Peltier. This year we also hosted the first annual Rochester Brain Bee, sponsored by the Rochester SfN chapter, and the department of Neuroscience. In this event 11 high school students competed to show who had the most brain knowledge and our winner had the opportunity to go to the national competition in Baltimore. There she competed against high school students from across the country, and came back with valuable feedback for us to better prepare our next winner. Our 2017 BAC activities also made an appearance at the first Rochester Science Expo following the Rochester March for Science. By experimenting with EMG kits, kids and their parents learned about how neural signals drive muscle contraction, while a beanbag toss game showed how the cerebellum can help our brains adapt when prism goggles (or “goofy goggles”, as the youngest kids call them) disrupt visual input. Our appearance at the Science Expo proved to be an excellent networking opportunity, putting BAC committee members in contact with young neuroscience enthusiasts and local science educators alike. From this event we made contact with several other schools, the Brighton Farmers Market “Ask a Scientist,” and AmeriCorp’s pre-collegiate program. Over the past two years, the BAC has directed most of its efforts within the Rochester City School District with the goal of reaching more students from disadvantaged backgrounds. Over two weeks this past April, we brought the Brain Awareness Week workshops to four different RCSD schools and DeWitt Road Elementary in Webster to reach 430 students in grades 3-6. These visits were extremely well-received by both students and teachers, with requests for our volunteers to return for Brain Awareness Week 2018. In addition to the new schools we have targeted in 2017, the BAC committee has made significant efforts to share our love for neuroscience with students of all ages. In July, Brain Awareness Week participated in the Rochester Museum and Science Center’s “Ladies in the Lab,” a 21+ event so that adults could also have a turn playing with our goofy goggles and EMG kits. We are having so much fun expanding Brain Awareness Week in conjunction with the Department’s goal of increasing Neuroscience Outreach. If you would like to get involved you can contact us by email and follow us on Facebook. For five years, the Pre-doctoral Organization for the Neurosciences (PONS) has served as a bridge for the neuroscience and neurology focused student groups at the University of Rochester. Last summer, President Humberto Mestre-Payne, Academic Activities Coordinator Holly Beaulac, Outreach Coordinator Monique Mendes, Communications Director Garrick Salois, and Treasurer Dawling Dionisio-Santos convened a new Executive Council to advance the missions set forth by their predecessors. PONS continues to expose pre-doctoral students to current topics and research opportunities in interdisciplinary neuroscience. This year’s Luncheon Roundtable Series consisted of five panel discussion events: Autism Spectrum Disorder with Liz Romanski, PhD, Loisa Bennetto, PhD, & Tristram Smith, PhD; Epilepsy and Seizure Disorders with Thomas Wychowski, MD, Laurie Seltzer, DO, Michel Berg, MD, & Joe Miano, PhD; Alzheimer’s Disease and Dementia with M. Kerry O’Banion, MD/PhD, Frederick Marshall, MD, & Robert Chapman, PhD; Multiple Sclerosis and Demyelinating Disease with Matthew Bellizzi, MD/PhD, Mark Noble, PhD, & Andrew Goodman, MD; and Vision and Retinal Disease with Krystel Huxlin, PhD, Duje Tadin, PhD, Mina Chung, MD, & Jennifer Hunter, PhD. PONS also provides relevant neuroscience education to community members of all ages and backgrounds. In October 2016, members were invited to discuss the brain and their own neuroscientific research with high school students in the UR Science and Technology Entry Program (STEP) – UP TO MEDICINE. Monique Mendes gave an introductory overview of the field and how the brain works. PONS members then explained each of their own personal journeys from high school to graduate school and how they became infatuated with neuroscience. Students broke into small groups for a quick brain anatomy lesson and to ask questions about the field. All students interested in partaking in PONS leadership, or those with suggestions for new PONS activities should visit our website, our blob, or contact us at urmcpons@gmail.com. In February, Krishnan Padmanabhan, PhD’s talk on “Big Data and the Future of Understanding the Brain” kicked off the Pangaea discussion series hosted by the Graduate Student Society (GSS) and Graduate Student Association (GSA). Originally the brainchild of first-year NGP student Tyler Cash-Padgett, Pangaea is a free-flowing group discussion centered on an issue of universal interest and importance. This series aims to engage students and a faculty presenter to share, challenge, and discuss perspectives across disciplines in the hopes of forming a more complete understanding of the topic at hand. The rise of artificial intelligence, critical opinions of future generations, and the popularization of science fiction have been recently deliberated. Third-year NGP students and GSS representatives Holly Beaulac and Shraddha Shah will continue to help coordinate the series. All students interested in partaking in GSS or the Pangaea committee or those with suggestions for new discussion topics should contact us at GSSBoard@urmc.rochester.edu. June 2017, Patrick Miller-Rhodes and Kathleen Gates travelled to Keystone, CO to attend the "Neuroinflammation: Concepts, Characteristics, Consequences" Keystone Symposium. October 2016, the now second year students went apple picking at a nearby orchard. Aleta Steevens: On September 25, 2016 at 1:36am Archer Dale Steevens was born. Keshov Sharma presented work collected from his lab in the summer of 2016 at the annual SOBP meeting in May 2017. The study, “Dual Neural Connections between the Amygdala and the Ventromedial (BA25) and Dorsomedial (BA24) Prefrontal Cortex in the Macaque”, was inspired by recent data in rodents implicating separate subcircuits between amygdala and infralimbic cortex, and amygdala and the prelimbic cortex, in fear extinction and fear consolidation, respectively. Please send your current email address and a work/home address to Tori D'Agostino, so that we can stay in touch! Rebecca Lowery received The Vincent du Vigneaud Award of 2017. Eileen (Imperato) Kalmar is currently a Clinical Assistant Professor, Department of Biomedical Education and Anatomy, Ohio State University School of Medicine. Pushkar Joshi is now Director of Strategic Initiatives at Inscopix. In 2015, Stephanos Kyrkanides left Stony Brook to assume the position of Dean, University of Kentucky College of Dentistry in Lexington, KY.
Colin Combs is Professor, Department Chair and Basic Science Chair of Biomedical Sciences at the University of North Dakota in Grand Forks, ND. This was a fairly recent appointment following consolidation of all the basic science departments at his institute; prior to this he was Chair of Pharmacology. See Colin's profile. Nathan Anthony Smith, PhD now works at Children’s Nationals in Washington, DC. Maria Diehl – Faryna ,September 24, 2016 – Maria and her husband Ethan recently met Keanu Reeves while he was filming a movie in Puerto Rico. Ethan was hired as an extra in the film, and he and Maria were invited to a wrap party, where they met Keanu. Ethan introduced Maria as a neuroscientist (he plays one in his new film), and Maria explained to Keanu that she studies fear and avoidance in rats. Keanu then started naming the brain regions involved in fear! Maria was both surprised and impressed by his knowledge. The following Monday, Ethan was working on the set one last time as an extra, and Keanu asked Ethan some science-related questions. Ethan replied that he was unsure but that his wife would have a better answer for him and asked Keanu if he would like to talk to her on the phone about it. "Yeah, let's do that!" he said. So Ethan called the lab and without hesitation said, "Maria, Keanu wants to ask you some questions about neuroscience. Here he is!" and handed the phone to Keanu. Stunned, Maria quickly gathered herself to answer his questions. What a once in a lifetime experience! "I just quizzed Keanu Reeves on the brain regions involved in fear. He got them right! Just another day hangin out in San Juan, Puerto Rico😎 — drinking mojitos at El Livin." Anne Grace Johnston welcomed her new baby on May 2nd, 2017. Imran Punekar is an intern in anesthesiology. He’ll be a first-year resident this year at SMH. In 2016, Helen Wei was a first-year resident in general surgery at Rutgers-New Jersey Medical School. She completed her internship in preliminary medicine here at SMH. Itender and Simi Singh – “Simi and my son (Imon) moved to India. Simi has joined as an assistant professor in psychology at Ashoka University, near New Delhi, India. She likes the place. So, I am also planning to move back to India. I have started looking at various possibilities in India. Meanwhile, I am trying to complete few papers at Washington University in St Louis. Here I am continuing my work on neurovascular dysfunction in AD. After screening the human AD brains, I found the activation of STAT3 in cerebral blood vessels. Pharmacological inhibition of STAT3 in 5XFAD-ApoE4 mice seems to provide protection. Cory Hussar got married on October 8, 2016. Verginia (Cuzon) Carlson – Faculty at OHSU. Tim Carlson is a Research Associate at OHSU in Verginia Carlson’s laboratory. Erin Johnson Venkatesh is a Research Technologist at Boston Children’s Hospital. In 2016, Nancy Ann Oberheim Bush completed her fellowship became a staff member at UCSF. Back in 2016, Yasser Elshatory completed a vitreoretinal disease and surgery fellowship at University of Iowa and is now with Eye Surgeons Associate in Bettendorf Iowa. Katherine Selzler is the Associate Consultant for Scientific Communications at Eli Lilly and Company.